Experts agree that the foundation for good health and vitality is a diet of plenty of fresh fruit and vegetables, wholegrains, essential fatty acids from nuts, seeds and oily fish, together with good quality protein. Despite the growing awareness of the importance of healthy eating, surveys show that many of us still fail to meet the recommended daily allowances (RDA’s) for important nutrients and that few of us eat the advised government target of five portions of fresh fruit and vegetables daily. Each person is bio chemically different, our needs are unique. These requirements may increase due to certain lifestyle factors such as stress, dieting, skipped meals, consumption of processed and refined foods, smoking, alcohol, regular exercise and medication. Environmental factors may also upset the levels of our body’s vital nutrients. 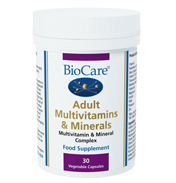 Supplementing with a good multivitamin and mineral can help boost the effects of a healthy diet and help correct any dietary imbalances or shortfalls. 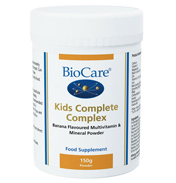 Biocare has a range of multi-nutrient combinations available for all ages containing vitamins and minerals chosen for their optimum absorption and bioavailability. All their supplements are formulated with the ‘hypersensitive’ individual in mind and are manufactured using carefully selected, high quality ingredients.